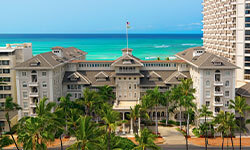 At Moana Surfrider, A Westin Resort & Spa, you’ll feel a sense of comfort and relaxation unlike any other. From the distinctive programs to the thoughtful amenities, this hotel property will ensure your stay will leave you feeling better than when you arrived. This Beaux-Arts style resort, with its gleaming white facade, grand columns and a distinctive porte-cochere is a legendary landmark on world-renowned Waikiki Beach. Colonial-style architecture blends effortlessly with contemporary furnishing and fixtures, welcoming guests to a place of refined elegance and old-world charm. Remarks: Price is per person, based on double occupancy at Moana Surfrider, A Westin Resort, historic banyan room or diamond city view room and is valid for specific travel dates of January 12-17, 2019, found on August 2, 2018. Advance purchase requirements vary. Other travel days and dates and accommodations are available at other prices. Optional airfare is additional. Price is not retroactive, and is subject to availability. Price does not include any applicable hotel/resort fees or departure taxes collected by hotel/resort/airport at destination. Does not apply to groups of 10 or more people. Prices, fees, rules and offers are subject to change without notice. Not responsible for errors or omissions. Prices are per person, in U.S. dollars, land only, based on double occupancy, subject to availability, and are not guaranteed until paid in full. Prices may vary by category or travel date. Optional airfare is additional. I am an Agent of change. I believe that travel is empowering. It changes people, and people change our world. As a travel agent with more than 15 years of service, I create unique experiences designed around my clients dreams and desires. I am a Master Travel Agent Specialist for the Islands of Hawaii. My expertise in Jamaica, Aruba, Puerto Rico, Grand Cayman, Bermuda and many other destinations benefit my clients and enhances their vacation experience. Speak with me and let us begin to plan your life changing Journey. Click for more information about me.